Only valid at participating Caltex Woolworths co-branded fuel outlets. Note that Caltex branded stores do not accept these eGift Cards, the store must be Caltex Woolworths branded, and not all Caltex Woolworths outlets are participating. 1. By using this eGift Card you agree to the full eGift Card Terms and Conditions. 2. This eGift Card is redeemable at participating stores. Participating stores may change from time to time. 3. For full eGift Card Terms and Conditions and a list of participating stores visit giftcards.woolworths.com.au. 4. This eGift Card has no expiry date. 5. Not reloadable or redeemable for cash. 6. 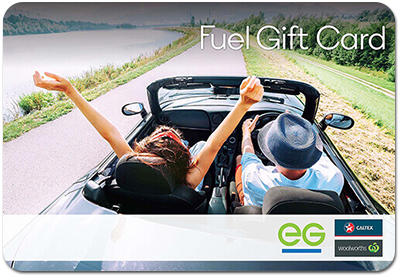 The Woolworths fuel offer is not available on activation of this eGift Card. 7. Woolworths will not replace lost, stolen or deleted eGift Cards. 8. For the balance on this eGift Card visit giftcards.woolworths.com.au or call 1300 665 249. 9. This eGift Card is issued by Woolworths Limited ABN 88 000 014 675.